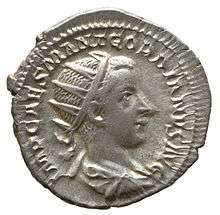 Philip transferred the body of the deceased emperor to Rome and arranged for his deiﬁcation. 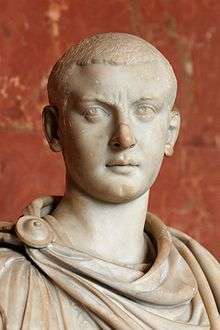 Gordian's youth and good nature, along with the deaths of his grandfather and uncle and his own tragic fate at the hands of the enemy, earned him the lasting esteem of the Romans. The soldiers held Gordian in high esteem, as he may have sacrificed his life to save them in 244. 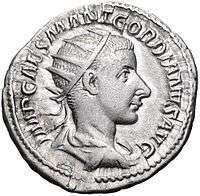 ↑ In Classical Latin, Gordian's name would be inscribed as MARCVS ANTONIVS GORDIANVS PIVS AVGVSTVS.